Dodge Ram 1500 at New York - Drive Dodge - Drive Sport! 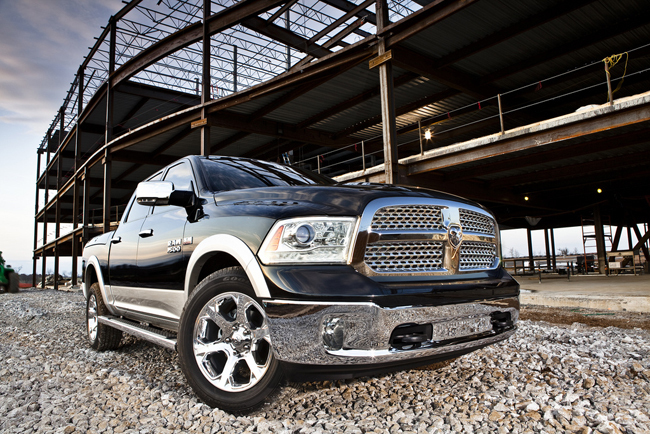 This year at the Auto Show in New York 2012 the updated Dodge Ram 1500 from concern Chrysler has been presented. Large SUV has undergone a significant facelift, but noticeable changes in appearance, according to the company, had also a very positive impact on the flow resistance of this vehicle. Let’s learn some more details about this! New Dodge Ram 1500 looks really cool with new inspiring grille, LED strips in the front lights and brake lights, chrome kit – the worst pickup company has not lost a single gram of its brutality, but the car began to look more modern and presentable, it looks like a heavyweight boxer, who attended expensive stylist and is now dressed by individual measures with elegant suit. But the main thing of this athlete is not a costume, and sturdy muscles. With this the new Dodge Ram 1500 more than in the order of time is – the power increase. Instead of last year’s 3.7-liter V6 now hides a 3.6-liter Pentastar V6, which produces 309 hp – Nearly half as much! This motor comes with temperature control system and the system “start / stop”. Now this giant is ready to conquer the world.